Come back on FRIDAY for the reveal of our first official paint color of 2018! Do you have a favorite paint color you'd like to share? Leave a comment below! I'm in major research mode right now so I would love to see what colors you love! That being said, I have been super hesitant to dive in and paint any walls white... I've done it before in the dining room, and though it was beautiful it just didn't sit right with me at that the time so painted it back within like 3 days. I also started painting the living room white earlier this winter, but only made it through half a wall before stopping. Scratch that idea! Anyway, we've also been on the lookout for new dining room chairs for a long time now but haven't found just the right ones. I like the ones that we have because they are really sturdy and durable, which is a necessity since my boys literally climb ALL OVER THEM! However, I'm kind of over the black furniture at the moment and wanted something a little more fresh. 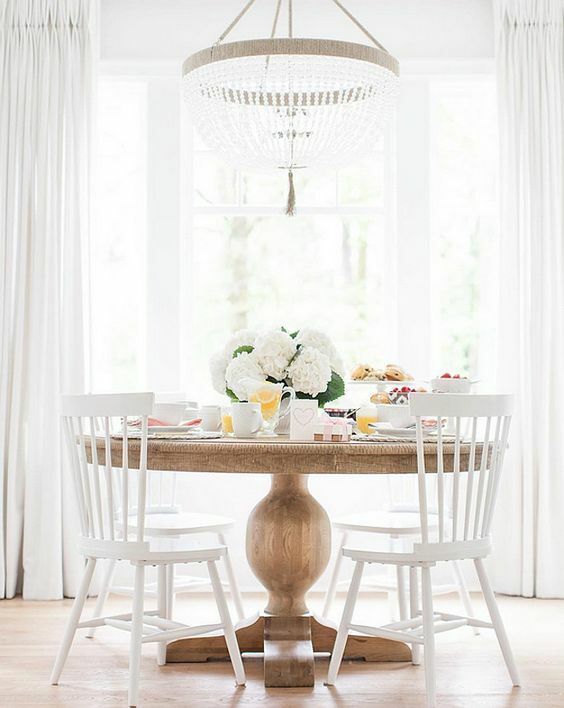 Well, the last few months I've been totally inspired by the glossy white chairs featured by some of my favorite bloggers/instagram accounts - those of Monika Hibbs and Jillian Harris to be exact! In their new (absolutely gorgeous) homes, they both have dining room chairs that are the similar colonial style as mine, just white! 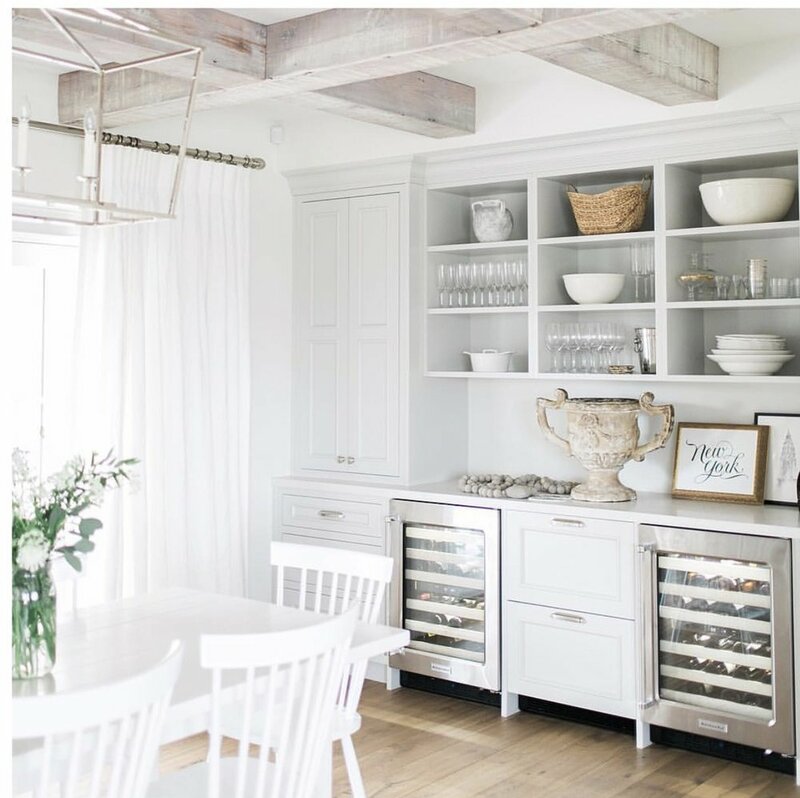 I also love the look paired with a rustic wooden table, which is exactly what we have in our dining room. 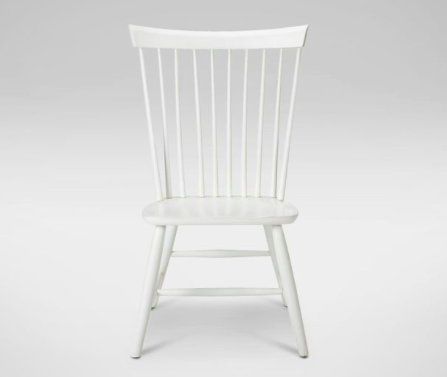 Painting my dining room chairs white = Perfect way to incorporate more white/bright without being scared PLUS it solves my dining room chair dilemma! Win, win! Here is the exact chair I would love to buy from Ethan Allen, but they are a little expensive! I'm glad I may be able to pull of the same style for much less! I started by sanding the chair with 100 grit sandpaper since there was a LOT of varnish on it. I literally sprayed it off with the hose to clean it, there was SO much dust! 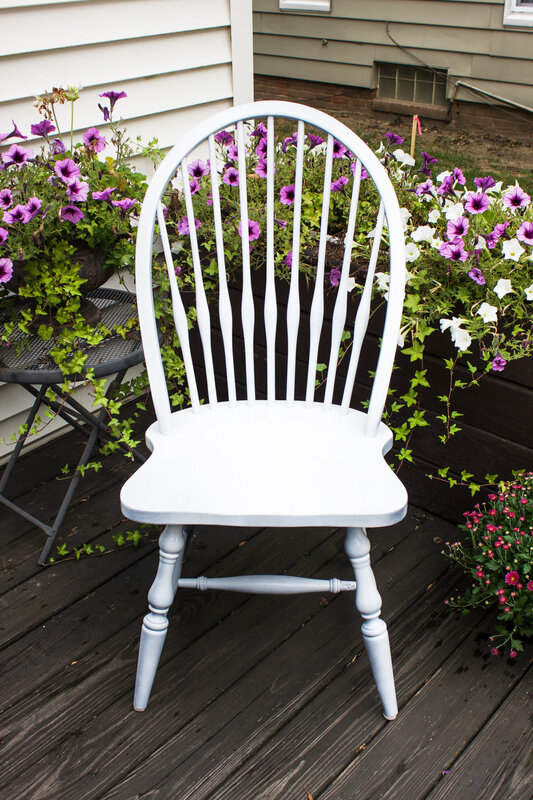 Evan then spray painted the chair with Rustoleum's Gloss White Paint and Primer.. It took about a can and a half of spray paint. It is currently drying and I'm currently trying to decide whether to go forward with painting them all white! Such a difficult decision! Do you think I should paint ALL of my chairs? No, I LOVE the classic black! Yes, the white is beautiful and trying something new is good! Thank you! I will share the results on an upcoming blog post! One of my favorite finds from the Country Living Fair this year was this BEAUTIFUL furniture paint from Caromel Colours! The colors are right up my alley - earthy neutrals! But truly, I think it was the beautiful packaging that got me... The botanical packaging on the two cans I picked up tie into my home's color scheme perfectly and serve as great inspiration as well as hopefully a great product! I got "Cattail" - a warm tan, and "Willow" - a light creamy gray. Now I just need to figure out what to paint! WHY the change again, might you ask? 1) The white was awesome for summer, but fall had me craving something warmer and richer. Originally I had planned on getting a nice warm rug for the room to bring in more color and to ground the space, but you should see the mess Miles has been making while eating recently... That rug would have been destroyed in a matter of days! We will be rug free in this room for a longgg time. 2) The wainscoting, crown molding, and built-ins in this room are SO BEAUTIFUL and they were completely getting lost with all of the white. 3) Just like the navy, the white just didn't feel 100% quite right. I can't explain it other than it was just a feeling I had that I could not get over! The lesson I walked away with from this experience is that you do not have to be afraid to try something bold or new! 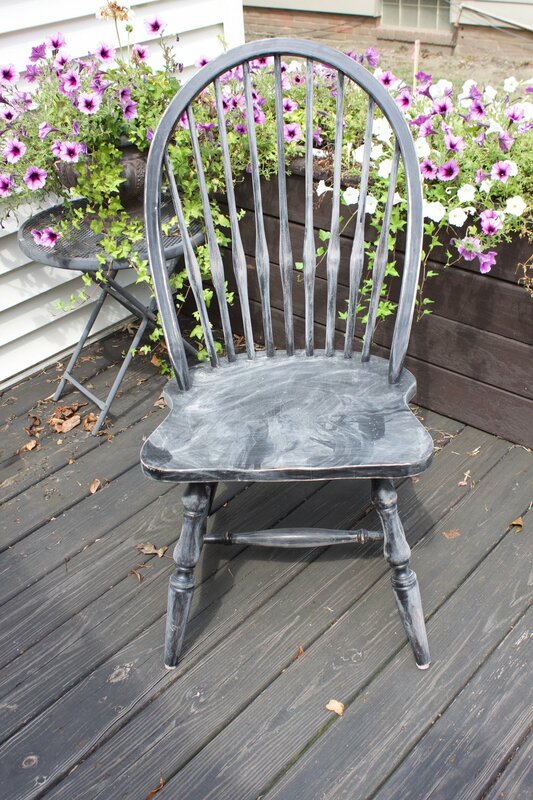 Paint is SO EASY and inexpensive to change (assuming you are doing it yourself!) It's okay to play with it and it's okay to be wrong and have to go back to square one. It's really not all that traumatizing or all that difficult! Additionally, I learned you just have to go with your gut and do what feels right for you. If you don't love something, CHANGE IT! You don't have to ignore that little nagging voice, embrace it and use it to guide you to what feels right. I will have the full staged result during my Fall Home Tour 2015 which will be published next Tuesday September 22nd! Myself and 15 other bloggers will be showing you our homes all decorated for fall that week! So excited!